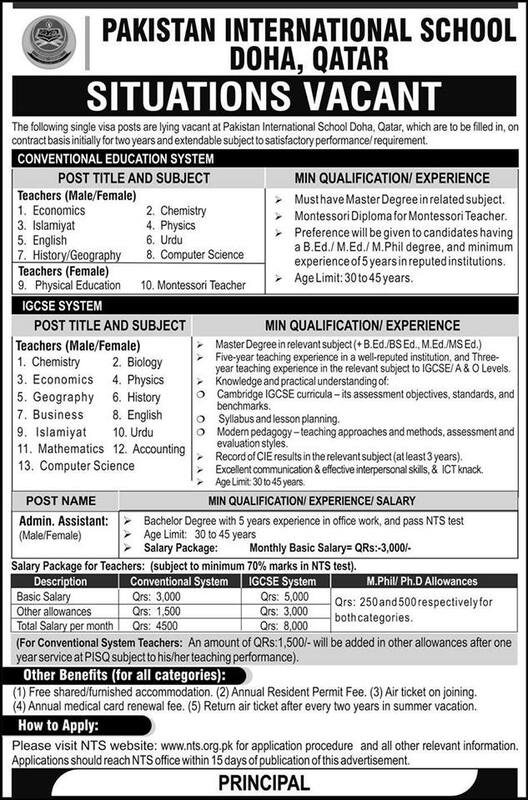 Pakistan International School announces a number of jobs for teaching in Qatar 2019.I will give you complete information about the jobs of Pakistan International School Doha Qatar Jobs 2019.The following single visa posts are lying at Pakistan international school Doha, Qatar are to be filled in on contract basis initially for two years and extendable subjects performance. You must be your Education Master degree in related subjects and B.ed/M.ed to apply for International School Doha job 2019.You must have a five-year experience to apply for this job.You must be 30 to 45 years old to apply to the Pakistan International School Doha Qatar.If you have any questions, then you can open comments.Both boys and girls in Pakistan International School can apply all over Pakistan. Must have master degree in related subjects and preference will be given candidates having a B.ED/M.ED/M.phil degree and 5 years teaching experience. You must be 30 to 45 years old to get a job Pakistan International School Doha Qatar. How to Apply for Pakistan International School Doha Qatar Jobs 2019?